Five years ago I would have told you that I hate parties. And that is after a lifetime of saying I hate social gatherings. But this Christmas I decided to host a caroling party. The thing is, this wasn’t the first time I’ve done this. Five years ago, I hosted a caroling party too. 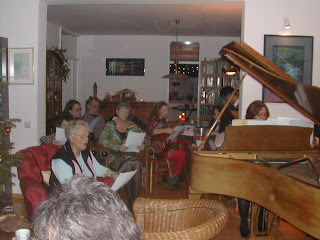 I did it because I love carol singing and wanted someone to sing carols with me, so I invited the neighbors and some friends who enjoy singing, and served a few cookies and coffee. They all had a wonderful time. I got to sing my carols, so I guess I had a good time too. Since we sang most of the afternoon, I didn’t have to worry about small talk, something I was once very bad at, but have, over time, developed into a passable skill. Still, there is that hole I have to leap over every time I’m in a group of people – if I don’t want to feel like a total idiot, I have to make conversation. I find most Germans exceptionally bad at making conversation with strangers and even friends, so guess who has to be the one to break the ice? I do it, but it is a strain, requiring no small degree of effort. I used to resent all the work, all the effort that went into my relationships. Never having been anywhere near the top of the list of most popular kids in school – rather, at just about the bottom of the heap, I think I have always felt a bit deprived in the area of social skills. When I was young, people didn’t seek me out, so if I wanted any friends, I had to go after them. But there were so many times when I resented this. I decided to stop going after people, to close up and wait for them to come running after me. Some people got written out of my address books, a few contacted me and we continued our relationship, and one or two precious ones have even sought me out. Over time, I found out that this decision to close up inside was a very bad one. It is one of the things I am now in the process of undoing. I was the loser, ending up bitter and lonely. Thank God, I met someone along the way who told me that the responsibility for making friends lies within myself. I realized that my initial reaching out was a good, healthy thing, so I decided to begin opening up to people again. During the ensuing years, I’ve done quite a lot of thinking about groups. I think I have evolved from the shy person afraid of rejection, therefore avoiding groups and the inevitable small talk, to someone who can enjoy the interaction. I am learning that parties can be wonderful events, even life-changing, small-talk and all. Let me tell you about the miracle of my caroling party this Christmas. This time, I began to prepare for the party weeks ahead of time. I photocopied songs in both German and English. The performer in me was dying to perform and be recognized. I visualized myself performing, and people enjoying my contribution. With a bit of trepidation, nonetheless, I began working on some piano music, planning to wow my guests with my musical talent, something I have semi-hidden from the world. I mean, they know I can play the piano, they hear me often enough as an accompanist, but this time I would dazzle them with a solo, finally acknowledging to them and to myself that I am truly a musician. I began to visualize the party in all its aspects, as part of my preparations. I suppose in the few times I hosted parties in my past, I did a sort of visualization too, visualizing all the people who wouldn’t show up, or who wouldn’t talk to me, or who would find the food or drink wanting, who would express or feel displeasure at my untidiness or lack of organizational skills. I would worry about my unworthiness to host a party. How could I host a party, since I was such a lousy friend to others? But I am learning to accept myself in my unworthiness. I don’t have to be the perfect friend to all to be worthy of hosting a party. On the other hand, maybe I’m not such a bad friend after all, and not such a bad person. I’m learning not to judge – not to judge others, and not to judge myself. So, this time I began to pray for each of the people I was certain would be there. I knew where each of them was struggling, and I prayed for God to bring a spark of healing life and inspiration to each one, including myself. I refused to judge myself for my own weaknesses, but to accept them, like all the pimples I used to have. I am that same acneed teenager, but the scars are fading, thank God. That morning I visualized everything I could think of. I visualized all the food I wanted to make. I visualized myself making it without stress. Visualizing, using the imagination in a positive way is, you see, practicing faith. It is putting your belief in God’s kindness and goodness into practice in a real-live situation. The next step is to go into the situation and see it happen. That morning I continued making my food. I prepared two quiches. One was a savory pumpkin quiche my husband told me few Germans would like. But we both find it deliciously different, and I trusted there would be others with daring palates too. I also made a conservative quiche Lorraine. While working in the kitchen, I played a CD of Christmas carols, singing along, visualizing the cozy living room, filled with people having a good time. I started seeing my husband as a fantastic member of our two-person hospitality team. He whisked around picking up, vacuuming, cleaning the bathrooms, setting the table, lighting candles, making coffee, doing whatever needed doing. Rather than feeling stressed that I couldn’t do it all myself, wallowing in the knowledge of my inferior organizational skills, I found myself able to praise Klaus-Peter, my super-organized German husband, full of gratitude for all he was doing. I was ready for the guests, eager to see them. I greeted them for the first time with pure pleasure. The fear of rejection was replaced by praying positively about it, visualizing acceptance and joy. Ines, who sings in a gospel choir with me, came with her son Kilian and her husband, Helmut, whom I had never met. My radar told me he was shy on the outside, like I am on the inside. But he was there, nevertheless, and we spoke politely to one another. What more can you do in such a situation? But it was OK because I didn’t expect more. Nine-year-old Kilian made up for all his dad’s shyness, holding audience with some young women who were there, entertaining them with stories about his school, charming me with requests for more of that delicious apple punch and questions about where exactly in America do I come from. Malcolm and Ulla came. They cook with us in what we call a “cooking club”, a group where we meet occasionally, each preparing an elaborate course of a gourmet meal. Malcolm and Ulla are unconventional, artist-artsy types of people, and their friends are unusual as well. They brought some of them along - a neighbor-turned friend, and his new girlfriend. Ralph, the neighbor, grew up with parents who managed to give him absolutely no social or life skills. Ralph is like a 45-year-old adolescent. But Malcolm and Ulla love him like a foster son. By some miracle, Ralph managed to find love in Ulrike, who also came to the party. Ulrike is a kind, compassionate, open, exuberant woman completely lacking in guile. At my party I found out how this came to be. She and her brother have the responsibility of caring for their 40-year-old sister, completely mentally and physically handicapped since having had meningitis at age seven. Ulrike grew up with special needs, and became a special person herself. Ulrike is an excellent singer, singing in four choirs. When I showed astonishment at the number of choirs she sings in, she unashamedly declared, “When you have a talent, you have to use it to glorify God.” Her new friends Malcolm and Ulla are openly agnostic on the subject of God, but there they were, singing along with the rest of us. Prayer is one of the parts of life where I am learning to be whole, to trust, and to live in my spirit in God. I believe wholeheartedly in prayer, but prayer is not exactly one of our western society’s favorite subjects. Nevertheless, I am working on letting go of my embarrassment about praying for other people. I have prayed for many people in Jesus’ name, who I believe is the Great Healer of the World, the entire reason for my caroling party. Malcolm was there but feeling quite ill, having been to a disco the night before, despite his heart disorder. He was in obvious pain, and unable to even accompany us on the guitar, which he plays very well. He allowed me to pray for him, right in the middle of the party. Peter came with his accordion, giving a jaunty atmosphere to the carols, playing along when I was unable to play the piano, busy with other things like praying for Malcolm or making more punch. 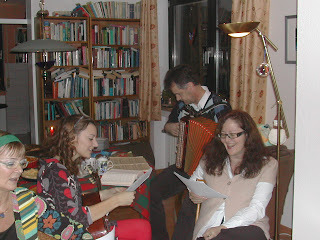 Klaus-Peter sang carols gustily, but later, as some guests tired of singing, slipped with them into his study where they looked at art books, discussing art history. While looking at one of the books with Ines, he discovered that she had authored two of the articles about German medieval art! Hella, too embarrassed about her lack of entertaining skills to entertain anybody, came with her talent of singing in harmony. Since Malcolm couldn’t play, she played the guitar for many of our songs. Linda lives next door to me. She is fantastically musical and had always longed to be able to play the piano. But she has agoraphobia and can only leave the house with great difficulty. After a year of deliberation, I decided to give her piano lessons. In one year, she has become an accomplished pianist. She remains painfully shy. After most of the people had left, I invited her to play for us. She received rounds of applause. I did, too, being her teacher. Her playing was beautiful. As she was playing, her mother was with me in the kitchen, telling about her brother who has lung cancer. I wished I could do something. But all I can do is pray. At the party, there was small talk. There was serious, sad talk. There was laughter. There was a lot of singing and instrumental playing. I didn’t play a solo, but the music was wonderful. Both quiches got eaten. All the apple punch got drunk and most of the mulled wine. I hadn’t even thought about next year yet. But there will be a caroling party next year. I have learned that there is a way to love parties.